Do you struggle with the idea of a daily prayer life? Have you ever found yourself asking along with the disciples, "Lord, teach us to pray"? Then this book is for you. Let us join the disciples as we sit at Jesus' feet and join Him in prayer. . . for an entire year. It is important to realize that The Lord's Prayer is not a recipe for answered prayer. Rather, it is a recipe for increased relationship with the One Who desires to answer our prayers. There is a very specific order in which Christ says we should approach God the Father. This order, if followed, brings the child of God into a place of gratitude, humility, and reverence. It seeks to bring the heart of the prayerful one into alignment with what beats God's heart and it moves the Christian to put feet to their prayer life. It is my desire as you go through the coming year with me, that you'll gain a practical, living understanding and personal experiencial insight into the realm of prayer that will lift you above the materialistic tendencies; above the selfish motives; above the need for instant gratification and attention, and into the realm of God's heart not just for you, but for those around you; not just for your own issues and needs, but those around you, and lastly, that you will experience the richness of just "being" in His presence. 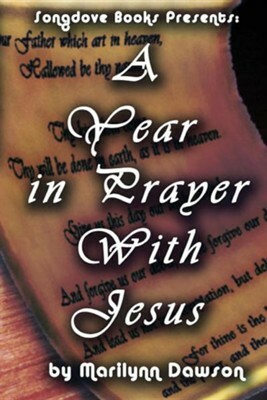 I'm the author/artist and I want to review A Year in Prayer with Jesus.